Who’s joining Brockmire for the new season? Recently, IFC announced the guest stars for the TV show’s upcoming third season. The comedy stars Hank Azaria as Jim Brockmire, a former baseball announcer who’s back to reclaim his career after a disastrous meltdown. The cast also includes Amanda Peet and Tyrel Jackson Williams. Season three of Brockmire will feature appearances by J.K. Simmons, Bob Costas, Martha Plimpton, Linda Lavin, Tawny Newsome, and Richard Kind. The new season debuts on IFC in spring 2019. NEW YORK – October 18, 2018 – IFC today announced details and guest stars for Season 3 of Brockmire, the critically acclaimed comedy series starring Hank Azaria as Jim Brockmire, the garrulous, recently-sober baseball announcer who’s climbing his way back to the major leagues. Produced by Funny or Die, Brockmire is currently in production in Atlanta and will return to IFC in spring 2019 with eight all-new episodes. 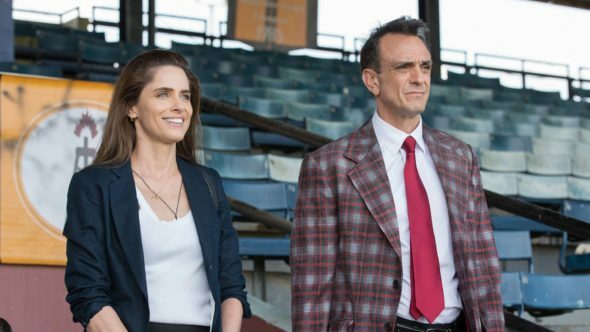 Returning stars include Amanda Peet as Jules, Brockmire’s ex-girlfriend, Tyrel Jackson Williams as Charles, Brockmire’s entrepreneurial best friend and Becky Ann Baker as Jean Brockmire, his weathered and tough-love older sister. · Richard Kind (Red Oaks) as Gus, Brockmire’s new producer with questionable leadership skills. · Tony Award(R) and Golden Globe(R)-winner Linda Lavin (Alice) as Lorraine, Brockmire’s estranged mother. · Tawny Newsome (The Carmichael Show) as Gabby, a NCAA Champion softball player and Brockmire’s new partner in the announcing booth. · Martha Plimpton (Raising Hope) as Shirley, Brockmire’s no-nonsense Alcoholics Anonymous sponsor in Florida. · Academy Award(R)-winner J.K. Simmons (Whiplash) as Matt “The Bat” Hardesty, a former baseball player turned sports announcer with a brash personality and loyal fan base in Florida. · Christine Woods (Hello Ladies) as Maggie, a self-assured oncology nurse who enters Brockmire’s life in an unexpected way. Brockmire follows Jim Brockmire, a famed major league baseball announcer who suffered a notorious public breakdown after stumbling upon his wife’s infidelity – a breakdown so bad that “Brutal Brockmire” became a viral internet meme. Season 1 began a decade later, as Brockmire looked to reclaim his career and reputation by calling games for the Morristown Frackers, an underdog minor league baseball team. Despite finding happiness in Morristown alongside his girlfriend/team owner Jules, Season 2 began with a newly-single Brockmire calling games in New Orleans and living with his co-dependent friend Charles… while fully indulging in the city’s booze-riddled sins. When a drug-fueled night of partying with a stranger ends with a near-death experience, Brockmire realizes it’s time to get sober once and for all. Season 3 takes place one year after his stint in rehab, with Brockmire doing play-by-play in the radio booth for the major leagues in central Florida while maintaining his brazen and narcissistic tendencies, despite actually being on the wagon. When an opportunity arises for Jim and his new co-host Gabby to take over as lead broadcasters in Oakland, he must fight to change his ever-present amorality. Brockmire originally appeared as a viral short video on the award-winning comedy website Funny Or Die. The series is written and developed by Joel Church-Cooper (Undateable). This season Azaria, Church-Cooper and Funny Or Die’s Mike Farah and Joe Farrell are executive producers. Mo Marable is also an executive producer and director. What do you think? Are you a fan of Brockmire? Are you looking forward to the new season? Love this show! Glad there will be a Season 3 and 4! Can’t wait to watch! Love this show! It is so non-PC & Hank Azaria is so talented & simply gut laugh inducing. And what a fantastic guest star line-up. Can’t wait.